MEININGER Milano Garibaldi i Milano, Italia: Bestill nå! Our new house is located near the railway station Garibaldi in the middle of Milan - uniquely central to Milan's vibrant downtown. Many shops and historical sights of the city are easily reached on foot. All public areas like the reception, lobby, lounge, breakfast room and bar are located on the ground floor, including the guest kitchen and the games zone, which are all typical features of a MEININGER hotel. If you cannot decide which one of the many restaurants in Milano you want to go, you can cook something tasty with your friends in our guest kitchen. As an alternative to a cozy day: you can relax in our comfortable lobby and chat with your family and friends. Free Wi-Fi is provided in all public areas and rooms. The perfect spot provides easy access to public transport. The famous 'Cimitero Monumentale', stands for its monumental sculptures, is within walking distance of the hotel. The sights of the historic old town can be easily reached in just 15 minutes by metro or tram. Aside from the city, our house has also a lot to offer. The existing building is reconstructed with the MEININGER standards. The room types will range from standard double rooms, private rooms with multiple beds to four-bedded dormitories. 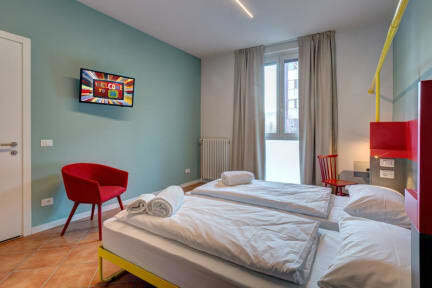 The well-equipped rooms have a Flatscreen-TV, free Wi-Fi, hairdryer and a private bathroom with high-quality furnishings. Our very friendly staff team are available 24 hours at the reception and will help you with anything you need. We are looking forward to meeting you! - Check in from 3:00pm. - Luggage room available upon request for any arrival before 3pm. - Check out until 11:00am. - Late check out till 2pm for 10.00 euros (only private rooms). - City Tax 2,00 euros per person/ night not included. - 24 hour Reception (No curfew). - Guests under 18 years can stay in private rooms with parental agreement. - You must be 18 or older to stay in a dormitory. - For bookings of several beds in dorms, we do not guarantee accommodation in the same room. - We have a no-smoking policy throughout the building. - Maximum stay in dorms is 14 days. - Linen and towels are included in all private rooms. In Dorms towels can be rented for 1.00 euro. General Cancellation policy: 24h before arrival. Payment upon arrival by cash, credit cards (Master & Visa), debit cards. Cancellations received 0 to 7 days prior to arrival or in case of No Show will be charged 100 % of the total reservation amount. The total price of the reservation will be charged 7 days prior arrival and it is non-refundable. If payment is not received, your booking will be cancelled.